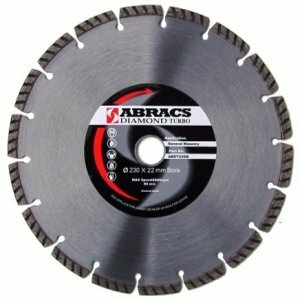 Abracs's Semi-flexible grinding discs are manufactured from Silicon Carbide (also known as carborundum) which is a rare natural mineral, moissanite. 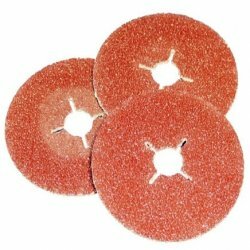 Silicon Carbide is the ideal abrasive material for cutting marble, stone, cutting cast iron and even cutting concrete as Silicon carbide grinding discs are well known for their ability to withstand heavy duty impact. The high grain contoured surface can quickly remove what ever material it is trying to clean, polish or cut. 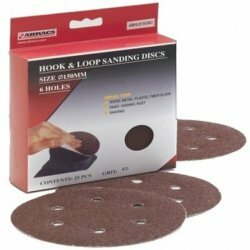 Semi-flexible discs should always be used with a backing pad. Industrial quality aluminium oxide sandpaper rolls. Manufactured using premium quality grain and sturdy, durable E-weight paper backing. Resin coated to resist heat and humidity. 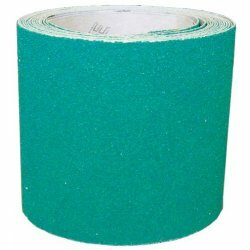 This product can be used on a multitude of materials including wood, metal, fibreglass and painted surfaces. Available in 5m, 10m and 50m rolls. Suitable for both hand and machine sanding. Premium quality ceramic grain abrasives for high stock removal and long life. 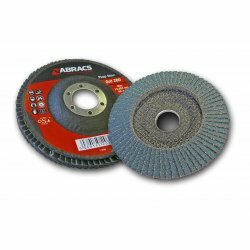 Abracs's Ceramic flap disc is suitable for use on a range of materials, even stainless steel, and is perfect for tricky items which have hard to reach areas. 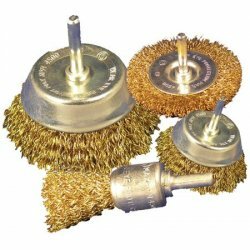 Brass dipped crimp steel wire brushes suitable for angle grinders and other special machinery. 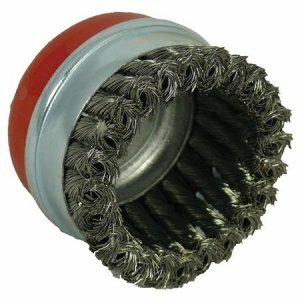 The high-density crimped wire makes the brushes ideal for polishing, surface preparation and most other cleaning applications. Also available in stainless steel. Industrial quality Emery Rolls in handy, easy to use packaging. 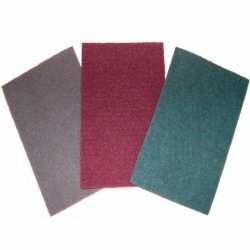 Premium quality aluminium oxide grain bonded to strong yet easy to tear J-weight cloth backing. 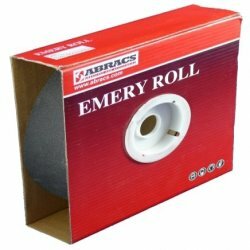 Industrial quality Emery Sheets in handy, easy to use packaging. Designed for general maintenance work, rust removal, sanding and polishing. 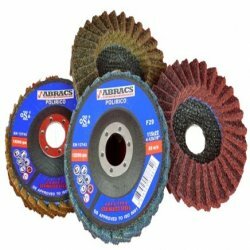 Aluminium Oxide flap discs are engineered for blending and finishing anything from wood to stainless steel. 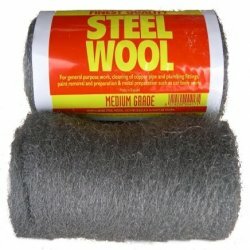 For high stock removal and long life abrasives. Ideal for use in hard to reach areas. Require a backing pad adaptor. 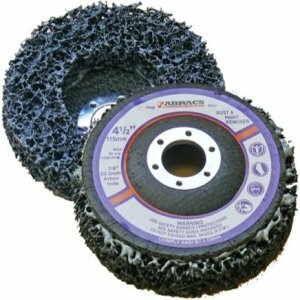 Zirconium sanding discs suitable for use on a range of materials including stainless steel. Ideal for use in hard to reach places. Require a backing pad adaptor. 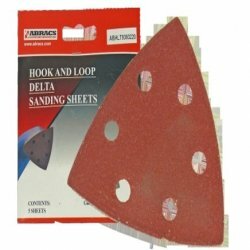 Industrial quality Hook and Loop Delta sanding discs for use with Delta sanders. 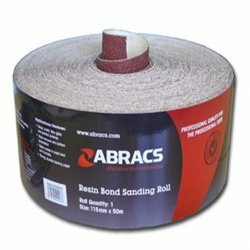 Suitable for use on a full range of materials including wood, metal, plastic and fibreglass. 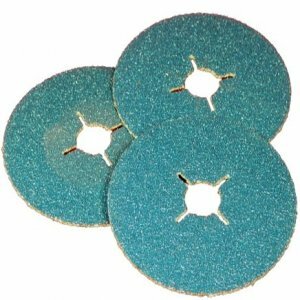 Industrial quality Hook and Loop sanding discs available in 125mm and 150mm diameters. Both sizes available with dust extraction holes or without. Suitable for use on a full range of materials including wood, metal, plastic and fibreglass. Should be used with a suitable backing pad. 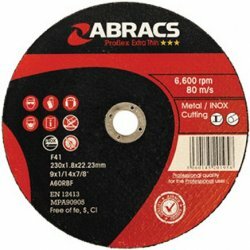 Abracs resin bonded cup stones are designed for use with angle grinders. Cup Stones give a very high stock removal rate making them ideal for coarse and aggressive grinding applications. 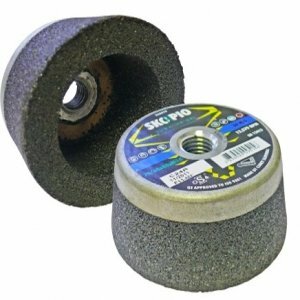 These resin bonded cup stones have been designed for flat surface grinding. A comprehensive range of spindle mounted brushes suitable for a variety of applications. Available with high resistance brass dipped steel wire or in stainless steel. Crimped wire for general purpose applications and twist knot version for more aggressive applications. All brushes fitted with a 6mm spindle. 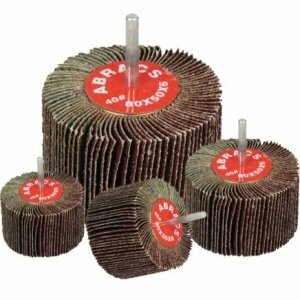 Top quality range of spindle mounted flap wheels available in a comprehensive range of sizes and grits. Designed for use with electric drills and air tools and suitable for virtually any application. Crimped steel wire brushes suitable for bench grinders. The high resistance steel wire gives the brush more aggression depending on users requirements. 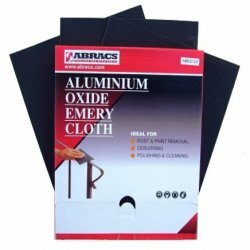 Ideal for metal surface preparation and the removal of rust and scales. 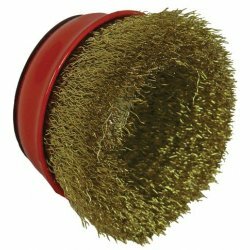 Brushes come complete with bore reducing bushes from 32mm to 13mm making them adaptable to virtually all grinders. A range of industrial quality wire wool suitable for a variety of surface preparation and finishing applications. Made from selected high grade steel. 100mm x 70mm x 25mm sanding sponge blocks. 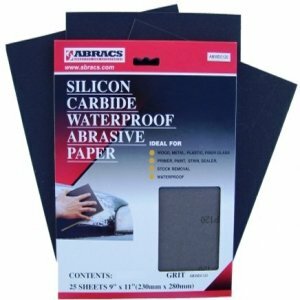 A sanding block and paper in one. 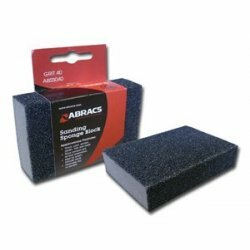 Very flexible for all surfaces, Abracs sanding sponge blocks can be used wet or dry and for fine finishing. Manufactured using tool grade steel and premium quality diamond grain. 150mm length with a 10mm diamond segment set into the metal core. Excellent working life, speed and performance. 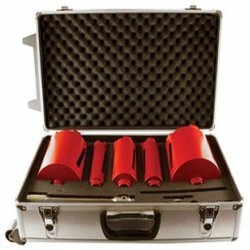 Kit contains the 5 most popular sizes plus a full range of accessories and is supplied in a sturdy and secure aluminium case. 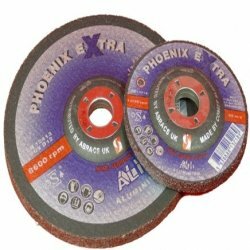 Phoenix Extra Ali is a complete specialist range of cutting and grinding discs designed specifically for use on aluminium and other non-ferrous materials. They have been designed specifically for special cutting applications where speed, efficiency and accuracy are all important. 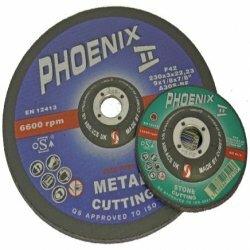 Extra thin cutting discs are the fastest and most efficient blades for cutting both mild steel and stainless steel. Extra thin discs do not contain iron, sulphur or chlorine and are suitable for cutting stainless steel, construction steel, and more. 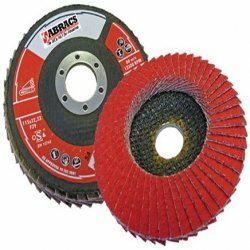 Abracs Phoenix II cutting and grinding discs are a popular abrasive due to their superior performance. 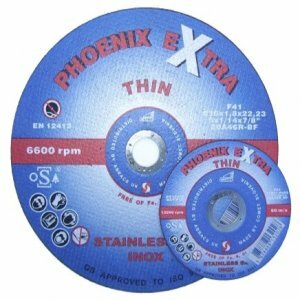 Phoenix II abrasives are a European manufactured range of discs and are perfect for metal. Brass dipped, stainless steel and nylon hand wire brushes. 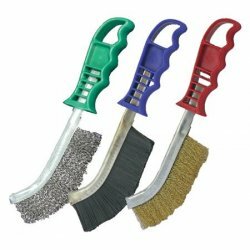 Hard to reach places can be cleaned with high pressure thanks to the curved shape and narrow face. 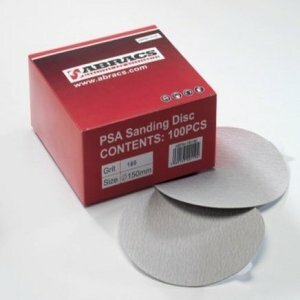 A top quality range of discs available for metal. Manufactured to European safety standards and marked with EN12413. Proflex discs offer professional quality performance and long life with the added edge of being extremely competitive. 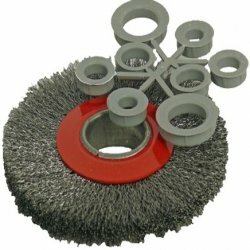 Cup brushes suitable for angle grinders and other specialist machiner. Twist knot brushes are sturdy and aggressive whilst offering the operator maximum safety. 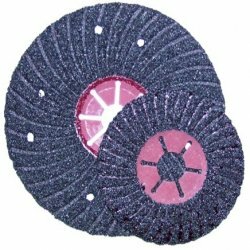 They are ideal for the removal of slag, rust, paint and residues of any kind. Available for use on mild steel and stainless steel.